Onion Sets Vs. Onion Seeds - What Is The Best Method To Grow Onions? When it comes to planting onion sets vs. onion seeds or seedlings, is one method really better than the other? When should I plant onions? And what varieties are best for my area? 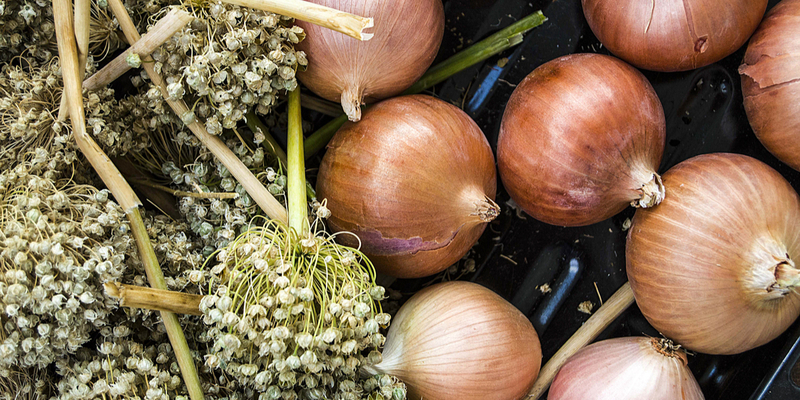 To be exact, onions can actually be grown three different ways. From sets (young immature onion bulbs), from seeds, or from seedlings (transplants). Knowing which onions grow best in your climate is a big key to success – no matter if you plant sets, seeds, or seedlings. Well, in reality, all three have distinct advantages and disadvantages. And choosing the right method all boils down to knowing what types of onions you want to grow, your specific climate, and how many hours of daylight the crop will receive. We will get back to the onion sets vs. seeds and seedlings question in a moment. But first, let’s take a look at understanding how onions grow, and how to know which variety is best suited to grow well in your climate. There are two important things to know about onions before selecting how you want to plant them. Onion sets being planted in the early spring. One is their growth cycle. The second is understanding which onion varieties are best for your climate. First, let’s talk about an onions growth cycle. Onions are a biennial crop. This means they grow, mature and seed over a two year period. During the first year, an onion grows from a tiny seed to a bulb. If planted early enough from seed, these bulbs will grow large enough to be harvested and used that year. But if the bulb is allowed to overwinter, it will resume its growth in year two. It is in this second year that the bulb matures to complete it’s growth cycle. During the second year of growth, the onion will flower and set seed in the bloom head. When this happens, it sends up a “bloom” and sets seed on the head of the flower. Thus completing the two year growth cycle. Now on to the second subject, choosing the right variety for your growing zone. The second important fact is that onion varieties are separated into three distinct categories. All of which are based upon the climate, sunlight, and days needed to mature. Short-day onions are mainly grown in the south and southwest. They are the “warmer” climate onions. These yellow Granex onions are a wonderful short day onion variety. Short days need around ten to twelve hours of average daylight to begin forming their bulbs. Although short day onions can be grown in northern climates, the bulbs do not mature to full size. Long day onions are mainly grown in the northern climates. These onions are planted in the spring from sets or seedlings. Long day onions need to get between 13 and 16 hours of daylight to begin maturing. Walla Walla onions are a big favorite among long-day onion growers. Long day onions cannot be grown in southern areas because the daylight never extends long enough to form or mature bulbs. Day-neutral onions are a bit different in that they will form bulbs no matter the hours of sunlight. These onions can be grown anywhere except the extreme south, where it gets a bit too hot for them to mature. Day-neutral onions need to be planted in the fall in warm climates, and early spring in the north. Spring onions are easily grown from onion transplants or sets. So that all leads us to onion sets vs onion seeds and seedlings. And of course, choosing which is best for you. Here is a break down of each planting method, along with the advantages and disadvantages of planting each way. Onion sets are small onions grown from seed the previous year. Instead of being allowed to mature, they are harvested as an immature bulb. Then, they are kept dormant until the following spring and planted. Planting onion sets in the early spring. Once planted, they mature into full-grown onions during their second year. The advantage with bulbs is they already have a head start on their growth. Not only can they be harvested sooner, they can also lead to harvesting larger bulbs. But, there is a disadvantage. With onion sets, you are limited to very few varieties. In the world of onions, there are hundreds of available varieties available. But with sets, they are usually found only in only the more common white, yellow and purple varieties. The advantage of growing from seed is that you open yourself up to a wide range of varieties. Although you can direct seed into the ground in warmer climates, onion seeds take a long time to grow and mature. Planting seed directly can be a tedious process. And, very hard to weed as they sprout. That means for warmer climates, they need to be sown in the fall or late winter. For northern climates, seeds should be started indoors 10 weeks prior to moving outside to transplant. In essence, this is the process of planting onion transplants or seedlings. And, it is a much better way to plant with seeds. For starters, it allows the onions to get a head start. In addition, it makes weeding and bed care much easier than trying to see the tiny seeds against any weeds as they sprout. Here is to growing your own delicious crop of onions this year!